I hope everyone had a very Happy Mother's Day. I got to spend it with both of my mothers, cooking all day. So yes! I'm back in the kitchen ladies and gentleman! After 5 straight weekends of traveling, I am so happy to be home for a while. My return to the kitchen is timely, since there are many exciting things happening in my friends lives - babies! Lots and lots of babies everywhere. Since I haven't been through this myself, I try to help the new mothers or mothers-to-be as much as possible. I do this by cooking (like I do for everything else). I love bringing meals to new moms so they don't have to worry about cooking. I have two go-to meals - Mushroom & Spinach Lasagna or Spinach Salad with Homemade Balsamic Dressing - decadent and healthy. Lasagna is the absolute perfect freezer meal! Since most Moms can't plan when they go into labor, freezer meals are perfect to have on hand for the first few days back to the house. A lasagna is hearty enough for a dinner and freezes for up to a month. I found this recipe from one of my favorite blogs, Smitten Kitchen, who altered the original recipe (slightly) from Ina Garten. Even though the béchamel-y and Parmesan layers add a rich and delicious texture, I always like a bit of color in my food, so decided to add fresh spinach into the layers. In addition, the Hubby decided that we should increase the amount of mushrooms in the layers as well. We like a lot of "stuff" in our lasagna. Other than those two small additions, the recipe is delicious the way it is. To make the béchamel sauce, bring the milk and garlic to simmer in a saucepan. Melt 1/2 cup (8 tablespoons or 1 stick) butter in a large separate saucepan. Add the flour and cook for one minute over low heat, stirring constantly with a whisk or wooden spoon. Pour in the hot milk, a little at a time at first and stirring until combined (with a whisk). Once half the milk is added, you can add the second half all at once, along with 1 1/2 teaspoons table salt, the pepper, and nutmeg. Cook over medium-low heat, stirring or whisking frequently, for 3 to 5 minutes, or until thick. Set aside. Preheat the oven to 375°F. Bring a large pot of water to boil with salt and a splash of oil to help the noodles from sticking together as they drain. Add the lasagna noodles and cook for 10 minutes. Drain and set aside. To make the mushrooms, heat 2 tablespoons olive oil and 2 tablespoons butter over medium in a large sauté pan. Cook the mushrooms with a couple pinches of salt for about 5 minutes, or until they are tender and release some of their juices, tossing to make sure they cook evenly. If you can't fit all the mushrooms, cook them in 2 batches. Now it is time to assemble the lasagna! Spread some of the béchamel sauce in the bottom of an 8 x 12 or 9 x 13 baking dish*. (If you’d like to freeze or give this dish as a gift, remember to use a foil pan). Arrange a layer of noodles on top, then more sauce (about 1/4 of what remains), 1/3 of the mushrooms, layer of fresh spinach and 1/4 cup grated Parmesan. Repeat two more times then top with a final layer of noodles, your remaining sauce and last 1/4 cup of Parmesan. Bake for 45 minutes, or until top is browned and the sauce is bubbly. Let sit at room temperature for 15 minutes before serving. To freeze for future use, allow it to cool completely and wrap two to three times in plastic wrap before freezing. *Note - I make several small lasagna's in loaf pans and freeze them. 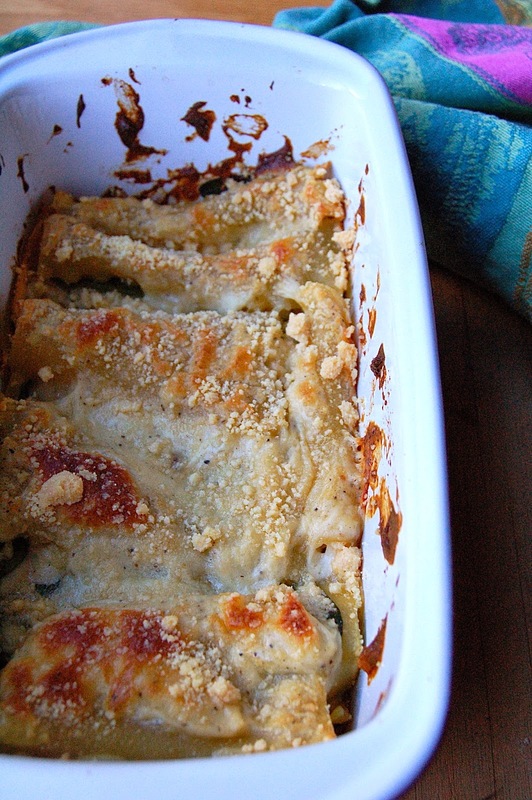 These are great for an easy weeknight meal with the Hubby! This looks so yummy def making next week!!! 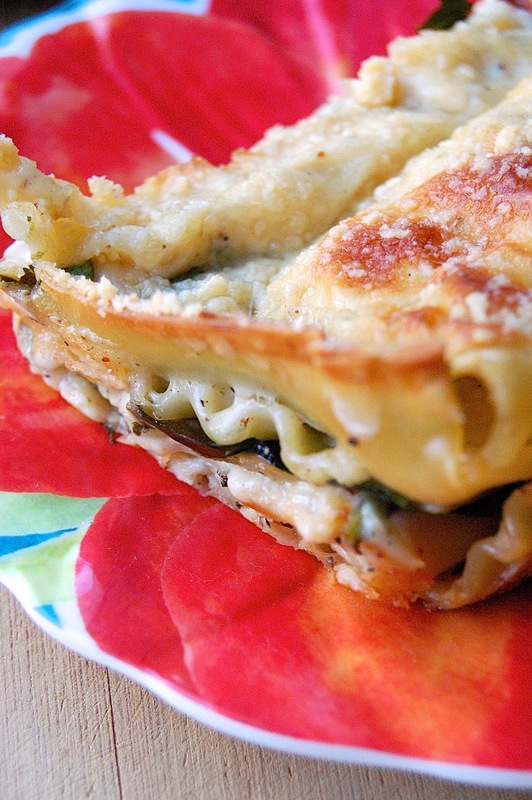 �� I saw a recipe w zucchini cut like lasagna noodles to substitute!! Yes! I have done that and also used eggplant slices. Make sure not to cut them too thin or they get really mushy after cooking long in the oven.